The center panel is made up of the 12 blocks I managed to make for Anina's quilt along. The top and bottom borders were made from flying geese triangles that I made using this method. I kept adding borders until I came up with this layout. I l-o-v-e the results. It's not huge-it only measures about 50" x 64". I backed it with green and added a pop of pink for the binding. I love those two fabrics together. I started Jacquie's Joy in the New Year Challenge with 19. I have finished 12 quilts since that time. 9 were WIP's, 3 were new projects. My final count will be 9 for the challenge. And I'm left with 9 WIP's. How did you do on your WIP's? Both quilts are the same pattern but in different colorways. I wrote this pattern as a mystery quilt along for Sew Hip Magazine. This one is called the Tide Is High. (Thanks, Susan, for the perfect name.) This was the quilt I made as I was designing the pattern. Heather contributed many blue and green scraps to the cause. I changed the binding colors to match the color blocks on the front of the quilt. The back is the solid dark blue you see peeking out. I am beginning to really like solid color backs on my quilts. I stippled it, of course. I have this one hanging on the end of my bed and it coordinates quite nicely with my bento box quilt. Love that. This one is called Lazy Summer Days. This is the quilt I made to test the pattern for accuracy. I apologize for the poor quality photos...I quick snapped them back in May before I shipped the quilt off to England. I was hoping to do a side by side comparison of the quilts, but this one isn't back in my possession yet. I love the soft colors of this quilt so much. Again, I stippled it and used 3 different colors of binding. Both quilts measure 60" x 72". Perfect lap sized quilts. This quilt was inspired by the photo in this post. When I saw it, I knew I just HAD to make a color wheel quilt. I whipped the quilt top up for a sample for the retreat, because I thought it would be a good scrap quilt idea to share. I wanted to do a circular layout, but the math made my head hurt, so I went the easy route. I do like the layout this way. A lot. You really can't see in the photos, but the two center white blocks are pieced from scraps as well. Each block is 12" finished. The yellow square is my favorite. I swirl quilted each of the color blocks with matching thread. Then I stippled the sashing in white. I haven't washed it yet, but I'm sure it's going to shrink and pucker like crazy because it's pretty heavily quilted. I can't wait. I bound in with a gray solid, because black was too black, white was too light, but gray was just right. I like how the gray compliments each color. And the backing, too. It measures 44" x 60". This was from my second round of the 9 patch quilt along. 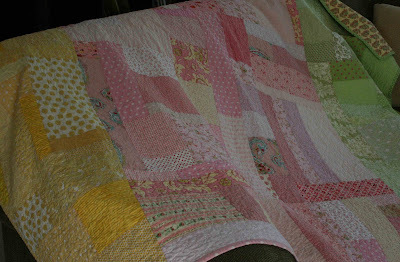 I do love scrappy quilts most of all. The printed fabric on the back is by Jennifer Paganelli. I love this fabric so much. I'm not sure if I love the white strips on either side of it, but what's done is done. I talked about the quilting in this post. Since so many of you asked, I should state that I started and stopped the quilting for each flower. That's when the auto cut button on my Juki came in very handy. I had a hard time deciding what to bind it with, but I fell back on my trusty flea market fancy fabric. I don't know how many quilts I've bound with this fabric. (many!) And it looks good every time. :) I'll be so sad when my stash runs out. Here's (almost) a full view of the quilt. It measures about 66" x 90", so a nice twin size. I'm also happy to report that my motivation for finishing up my WIP's has kicked in to high gear (finally) and I'm having so much fun! I worked on 3 different quilts today. One of them is soooooooooo good! I can't wait to show you. do you know how many charm squares make a king size quilt? do you know how many hours it takes to sew them together? neither do I. I started sewing these together at the retreat in the beginning of November. It seemed to take for-ever. The fabric is simplicity by Moda. I absolutely L-O-V-E this fabric. This is going to be my summer look for my bed. I think it goes without saying that my husband doesn't care how girly our quilts are. Hurray for that! Man, it's hard to blog this time of the year, isn't it? I haven't been making any top secret presents or anything, just plain busy. I finished a pair of socks for my oldest son. They are just ankle socks, so they knit up fairly quickly. He was sooooooooooo excited when I finished them. I love that he loves the things I make for him. I have a half a pair knit for my other boy, with many requests to make the second sock soon. This is kind of gross, but both of my boys thought that hand knit socks were not washable. (Can you say ewwww???) I was sure to correct them and let them know that this was definitely not the case. I have my house clean and dinner simmering on the stove, so I'm off to quilt. Yay! Math is a huge part of quilting, like it or not. I'm not particularly fond of math, but it's a necessity, especially since I rarely use a pattern. "I'd like to make a twin size quilt out of charm packs. How many squares do I need?" Or, "How many more blocks will I need to make the 9 patch quilt into a full size?" Or, "I'd like to make your stacked coins quilt, but in a queen size. How many more charm packs and how much yardage would I need?" These are just a few that come to mind. Well, today I'm going to walk you through these and show YOU how to do the math. :) Some of this may be pretty basic, but I think it's worth covering. I work with a calculator and a piece of paper and a pencil. No EQ for me. I'm old fashioned that way. A nice baby size quilt is around 42" x 52". 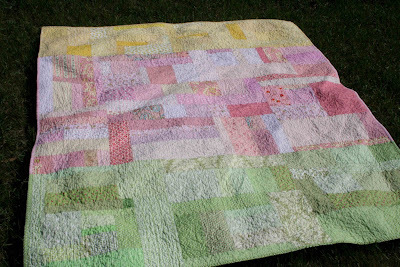 For a square baby quilt, anywhere from 36" to 42" works well. A crib quilt measures 45" x 60". A nice lap size quilt is 60" x 72". Twin size, 63" x 88". Full size, 78" x 88". If you are making a quilt for a specific bed in your house, it's best to measure the top of your mattress and add the amount of overhang you want on each side, then you will have the perfect measurements for your bed. I'd recommend this, especially if you have a very deep mattress, or if you have head and foot boards to deal with. Or bunk beds. These are target sizes. If your block calculations don't work out quite right, just round up. Ok, for the the first question, how many charms will I need to make a twin size quilt? Take away 1/2" (for seam allowances) and your finished square will equal 4.5". 88" (length of quilt) divided by 4.5" (finished square)=19.56, which would round up to 20. So 14 x 20=280 charm squares. Your layout will be 14 blocks wide by 20 blocks long. The quilt will measure 63" x 90". The finished quilt measures 66" x 90" for the twin size. Each 9 patch block finishes at 6" and each sashing strip finishes at 2". Since you want the quilt to be at least 78" wide, you will need 12 extra inches. You would need 20 extra blocks (ten for each additional column) and then add in the sashing 2" finished x 2 strips. The width of the twin quilt is 66" +12" (for the two extra columns of 9 patches) + 4" (for the two extra strips of sashing) =82", which is a bit wider than your target of 78", but close enough. Plus, it's nice to have it a bit too large than a bit too small. So the number of 9 patches needed would be 70 (from the original pattern) +20 = 90 for a full size quilt. Does that make sense? 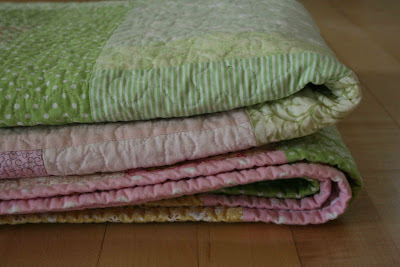 Now, for the toughest one...a queen sized stacked coins quilt using this tutorial. Your target size is 84" x 92". Coins are cut 2.5" x 5", which will finish at 2" x 4.5". The sashing is cut at 3.5", which will finish at 3". 11 columns of coins x 4.5" (finished width)=49.5"
12 columns of sashing x 3" (finished width)=36". 49.5" (total coin width) + 36" (total sashing width)=85.5" wide. Perfect. This one will be worked backwards. You want it to be 92" long. Subtract 6", for the top and bottom sashing, which will give you 86". 86" divided by 2" (finished height of each coin) =43. So 43 coins in each column x 11 columns= 473 coins. 473 divided by 2 (number of coins that are cut from a charm pack)=236.5, which would be rounded up to 237 charm squares required. If there are 40 charms in a pack, you would need 6 packs of charms. for a total of 4.88 yards, to which I would just round up to 5 yards. Ok, any questions on how to do this? Remember to calculate with your FINISHED block size, not your CUT size, or you will have a quilt that will be much smaller than anticipated. I finished a new Christmas quilt! 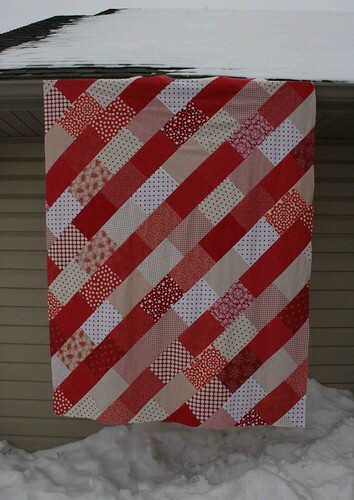 There is a tutorial up on the Moda Bake Shop for this simple quilt that features the Figgy Pudding fabric line. This quilt is QUICK! There is still plenty of time to (start and) finish it up before the holidays. This one actually matches my house. Bonus! 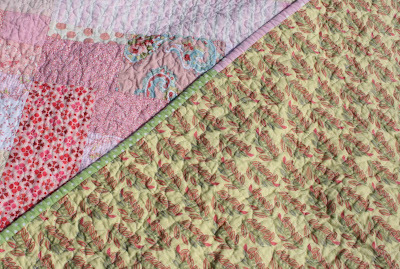 ;) I have 3 Christmas quilts in my collection now, with an idea for a 4th one that's been brewing for a long time. Hopefully I can get to it soon! edited to add: oops! i made a yardage calculation error. (ironic, since i just posted how to calculate your quilt measurements. ha! :) ) for the center panel, you will need 1 3/4 yards of fabric, not 1 2/3 as originally stated. the green fabric is from JoAnn's. It's from their classic cotton line in the color celery. I finally started quilting my 9 patch quilt yesterday. I did a few practice doodles before starting on the real quilt. I usually practice with fabric that is not pieced, but recently, I have discovered that I like to try a new quilting technique on a pieced block because it is a more realistic test with the seams to quilt over. Plus, it's my new solution to using up those pesky orphan blocks. I really really LOVE these quilted flowers! It's a twin size, so it's taking awhile, but I'm very happy with the results. Here's a shot of the back of the quilt. I love the white on white quilting. Also...Emily, who is amazingly sweet, has recruited several women to make me 9 patches for my 3rd quilt (for my other sister) since I was experiencing 9 patch burn out. I have received several blocks (plus extra squares for the borders!) from different ladies across the country and Canada. Thank you so much, ladies, for your generosity and for helping me get started on my 3rd 9 patch quilt!!! I'm excited that each of my sisters and I will have "matching" quilts. Yipee! My husband works downtown Minneapolis and since he only had one meeting to attend today, he invited my daughter and I to go along with him so we could spend more of the day together. I'm so glad we did...it was great fun. I'm also glad that I remembered to take my camera. We spent some time at the public library in the kids section. I found inspiration in some well illustrated kids books. This one is Hello, Day! by Anita Lobel. The pages were brightly colored and fun. Some of the pages reminded me of Kaffe Fasset quilts. I loved the line of brightly colored flowers on this page. And the use of circles on this on this page. I hope to make a quilt inspired by these. Someday. Also, the floor vents and colors caught my eye. I "see" quilts everywhere. I'm not sure if that is a blessing or a curse. After my husband's meeting, we had a burger at Lyon's Pub. He's out having coffee now and my daughter is "resting", so I have a bit of time to quilt before my boys get home. It's been a very good day.